Construction on Elmer H. Fisher’s design for the Hastings Building began in 1889 and was completed in 1890. The morning Leader observed in November 1889 that the Hastings Building, still under construction, was “conceded by all to be the most elegant building in the city.” It went on to enumerate “such progressive features as the two interior staircases, wainscoting of redwood, and the unusually large (96”x100”) plate glass to be used on the first floor storefronts”. By the time construction began on the Hastings Building, Port Townsend was less dependent upon building materials brought in by ship. 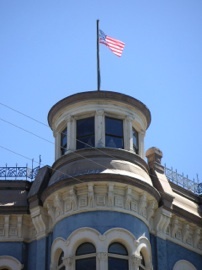 The cast iron columns at street level, seen to particular advantage flanking the handsome west entry, were cast by the Port Townsend Foundry, which had been established in 1883. Of all the materials used in construction, only the ceilings of the main floor stores, patented embossed iron that imitated decorative plaster and was currently thought to be “fireproof,” is recorded as being imported (these were from Northrup Company in Pittsburgh). The morning Leader reported that “It has double floors throughout; the offices are all large and provided with every convenience and are arranged for either gas or electricity.” Such amenities, not available in earlier Port Townsend office buildings, assured a full complement of tenants. The highly desirable corner location was occupied by a real estate office, which shared the ground floor with Enoch F. Plummer, “Cigars, Tobacco, Confectionary, and Smokers’ Articles,” Max Gerson Dry Goods, and Jarrett T. Lewis Co. Port Townsend Summer School of the Arts, a forerunner to Centrum. Since that time the upper floors have returned to their vacant status and have remained vacant to the present. Various tenants have consistently occupied the main floor over the years. Current tenants include the Kim Thomson Art Forms, The Broken Spoke (bicycle rental, retail and repair), About Time (a women’s and children’s clothing store), and Frameworks (art framing and retail). 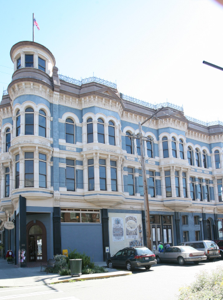 The Hastings Building is located in Port Townsend’s downtown Historic Commercial District. This beautiful example of Elmer H. Fisher victorian architecture has three floors which are currently planned for a full historic rehabilitation as part of the Hastings Building/Hastings Landing Project. For more information about this exciting historic rehabilitation project, contact our Project Manager by email at heather@hastingsestate.com or by phone at (206) 387-9846. 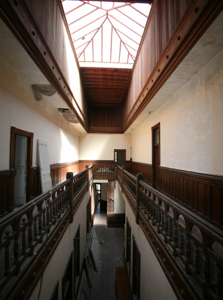 Top Left: Original woodwork, including redwood wainscoting and detailed ballistrades, are well preserved in the interior of the building. Bottom Left: The back of the Hastings Building and the site of the new Hastings Landing, pictured from Union Wharf. Right: The conservative Romanesque style architecture of the Hastings Building makes it a dominant part of the downtown Port Townsend skyline. The magnificent bay windows in the second and third floors give the structure a massive undulating form. The atrium is topped by a skylight which, when the rehabilitation is complete, will run across its full length and provide a stunning sense of light. Note that many of the offices facing the hall have windows that give an exterior feel to interior spaces. Port Townsend, WA. The original design of the building included a spired cupola atop this northeastern bay, which we hope to recreate in the final phase of the building’s rehabilitation. 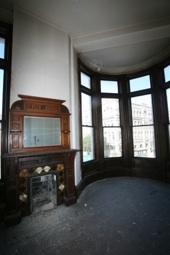 This fireplace is located in one of the existing offices. Inlaid with Italian marble, this feature makes a statement of elegant quality which we will strive to preserve throughout the rehabilitation. Much of the original hardware remains in excellent condition in the interior of the building, including iron door hinges like the one pictured above.